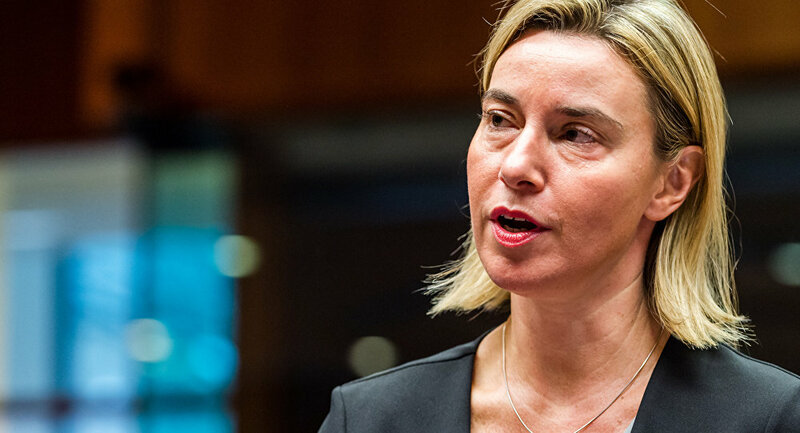 The European Union is planning to find ways to use battlegroups to improve EU security as well as security of some of the bloc’s neighboring states, EU foreign policy chief Federica Mogherini said on Tuesday. BRUSSELS (Sputnik) – The EU battlegroups were established in 2005 with 18 battalions consisting of at least 1,500 soldiers. "It is an instrument we already have; it is an instrument that could be already used but because of lack of political will so far in ten years it has never been used. Maybe there are ways in which we can work on making them usable and this could be a contribution to not only the European security but also the security of some of our neighbours," Mogherini said at the Informal EU Defense Ministers meeting in Bratislava. The bloc is now revising its defense strategy, discussing prospects of establishing an EU army. On September 11, French Defense Minister Jean-Yves Le Drian and his German counterpart Ursula von der Leyen filed a joint proposal to the European External Action Service, calling to set up the bloc's joint defense through facilitation of EU collective defense operations, building a common satellite surveillance system and establishing EU joint military headquarters. The plan, which goes back to 1950, was revived in March 2015 by European Commission President Jean-Claude Juncker, who said the bloc needed its own unified army to respond to threats posed to EU member states.